Statista.com, a leading market provider of consumer data indicates that as of January 2018 the number of unique mobile internet users is 3.7 billion. This is an impressive growth in correlation to the February 2017 percentage of worldwide internet access through mobile phones of 49.7%. That is a staggering 52.64% of global page views per month with 65% of that being generated by the Asian region alone! And with this in mind, more and more people are willing to spend their time and money on apps to enhance their mobile user experience, so much so that it has accounted for 197 billion (yes with a "B") for app downloads for that same year. 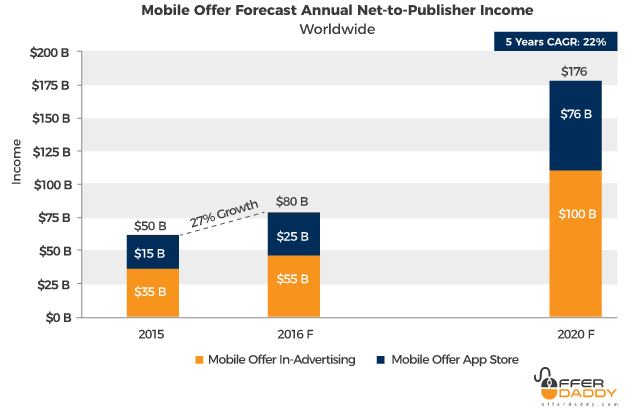 This trend is so significant particularly to app developers since the growth in net-to-publisher revenues and in-app purchases is perceived multiply as much as $189 billion by the year 2020! And so the big question now for app developers is: How can you successfully turn your app into a profitable channel for massive revenues? If you are interested to know more about this and unleash your app’s true earning potential with the help of OfferDaddy’s latest generation of monetization tools, then we recommend that you go on reading as we are going to tackle applicable app monetization tips as well as determining the best monetization approach as provided by app monetization companies. Start Earning with Your App in 3 Minutes, REGISTER NOW. 1. Determining your target users - In order to arrive at the best app monetization strategy, you should find out your target market. In short, you must know the mobile users who are likely to be interested in your app. You can easily do this by tapping into leading online app market data intelligence providers like App Annie, Applyzer, and Priori Data and figure out their app usage patterns as well as their behaviors every time they use their mobile devices. Carefully analyze the data you have gathered and base your monetization strategy according to their tendencies. 2. Develop a valuable product – Focus on the value that your app can bring to your target users and build an applicable mobile app monetization plan around that. If your market ‘sees’ the value of your product, then they would gladly pay for it if needed. 3. The first 30 days are always critical for user engagement – Give off a great first impression by introducing not only the value of your app to the users but also the features and functionality it brings to them. In doing this you are setting the right impression to your target consumers and will make them want your app even more. Hence, this period is very critical for your apps’ success. 1. Free Apps or In-App Advertising – In this model, you provide mobile users with free purchase and download of your app. The main objective is to get the information of your target market as you user-base is growing massively at the same time. 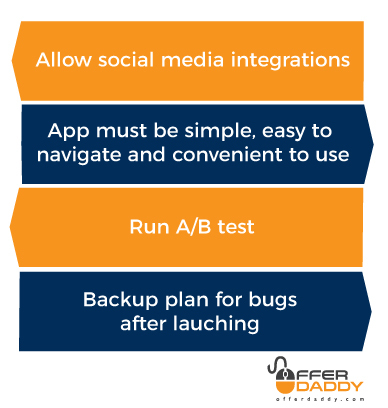 The benefits of opting for a free app model is that you will acquire 20% to 60% of user engagement if you are using native ads and/or targeted advertising and has an easy-to-implement tool which is convenient for monetizing your apps like Offerdaddy’s SDK for offer wall, top paying surveys wall and rewarded video (in development). 2. Videos and Interstitials – These methods are also mentioned in 4 App Monetization Strategies That Are Better Than Banner Ads by Huffington Post. Essentially, videos can be classified as reward type wherein a user can receive a sort of in-app compensation for watching the video or a non-reward variety where the video is placed somewhere without affecting the user’s experience. This is a perfect match for the soon to be implemented Offerdaddy’s rewarded videos. Register now to explore our tools. On the other hand, interstitial ads are full screen ads which are placed in between the screen. They are placed in such a way to “attract” the user without hindering the natural flow of the app to provide real value to users. 3. Surveys and Offers Walls – In this model, only a specific amount of content can be viewed by the user. After which, the user may opt to complete an offer or a survey being provided in order to view more content. 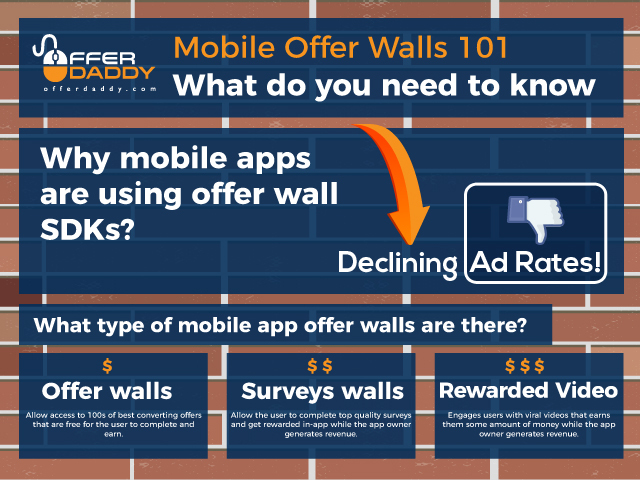 Offers or surveys walls strategy is ideal for content driven apps like news, music, video, etc. Offerdaddy provides a wide range of offers to complement with this model. After signing up and implementing the Android or iOS SDKs, your users can choose from any of our top converting surveys and offers specifically targeted for each mobile device. 4. Combination of different models – Developers can also take advantage of implementing different monetization plans to suit your app’s functionality. For instance, you can include an in-app ad on your free app and the users have the option to get away with this once they upgraded to premium version. Just make sure this customization does not interfere with the customer’s user experience in any way. All in all, the implementation of mobile app monetization strategies is something that should be carefully prepared. And the model of your choosing should be appropriate to your app so that you and your users can benefit both ways. With Offerdaddy’s mobile app monetization tools you can achieve this and much more while providing the best experience to users as possible.